Abbots Hall in Kendal is a hard working and welcoming museum. By that I mean it really makes the most of what it has got and attracts good touring exhibitions to grace its top floor. It has one permanent star artist, George Romney (1734-1802), who was born in Dalton-in-Furness and trained under a portrait painter, Christopher Steele, in Kendal before moving to London. His masterpiece: The Gower Family: The Children of Granville, 2nd Earl Gower, (c 1776-7) is in Abbots Hall. This huge (203 x235cm) group portrait shows the older half sister, Anne, shaking her tambourine (on the right). The younger children dancing in a circle are his son and daughters from a third marriage. Yes, that’s a son staring directly at us from behind the middle dancing girl – not “breeched” yet as he is still in a dress. From left to right: Georgina, Susan, Granville and Charlotte Sophia. 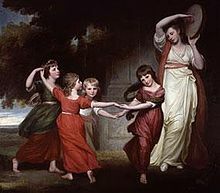 Romney had recently visited Italy and this work shows his up-to-the-minute interest in classical themes and poses with the dancing “Arcadian” children and antique column behind. Close up, the faces are wonderfully vivid portraits, full of character and life, however Granville’s body and arm don’t match the tilt of his head and the body is curiously unfinished compared to the rest of the family. I was guessing the children only sat for head portraits and maybe some full body sketches and that the details were added in at leisure. Was it finished off by an inept apprentice? Or was the patron impatient? Perhaps this background was considered unimportant? Or was it just a small fidgety boy? I contacted the very helpful Romney Society and their Research Fellow, Alex Kidson, said that probably Granville was a late addition to the composition; his parents may have originally thought that at three years old he was too young to sit. 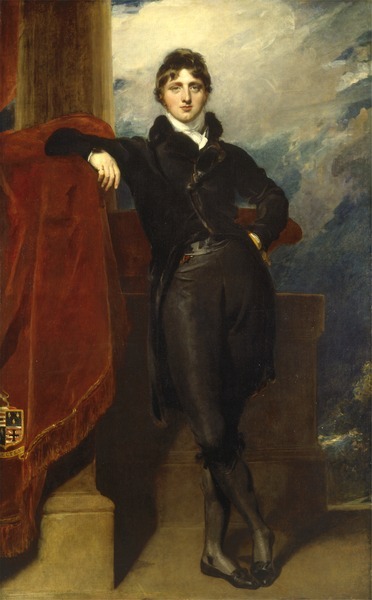 In his early 30s, Granville was painted again by another renowned artist, Thomas Lawrence, during his time as British Ambassador to Russia. This time he stood still. If you would like to visit Abbots Hall and need more information, here’s their website. Categories: Arts, Kendal, Things To Do | Tags: Gallery, Kendal, Lakeland Arts Trust, Romney | Permalink.